Hop on over to Folsom for some spring pictures! For the month of April, we will be hosting a mini session event at our studio. This is a great time to get outdoor photos, the trees are blooming and everything is turning green. The Mini Session is $49, and includes one high resolution digital image, perfect for sharing online or for ordering prints. Additional prints and images available upon request. Call us today to schedule your photography session and for more information! 916-608-9999. $49 fee is due at time of booking. Attention all graduating seniors! We know how busy you must be right about now, so let us check something off your list. Call today to book your senior photography session! This special includes the digital images of any print package that is ordered, as well as a free one hour photography session with options of an outfit change. Call us today to schedule your photography session and for more information! 916-608-9999. $25 refundable deposit is due at time of booking. In July of last year, we were contacted by Live Happy Magazine to do some editorial photography for an upcoming issue. The story focused on Folsom’s local Gina Mulligan and her non-profit Girls Love Mail. Working with Gina to get the photos for the article was inspiring! It’s hard not to feel uplifted by her happy and grateful spirit. We’re so glad we could work with her, as well as Live Happy to spread the word about this amazing program. To learn more about Girls Love Mail and to send a letter, visit their website here. You can also check out Gina’s book full of heartfelt letters, Dear Friend. We want to share our luck with you! 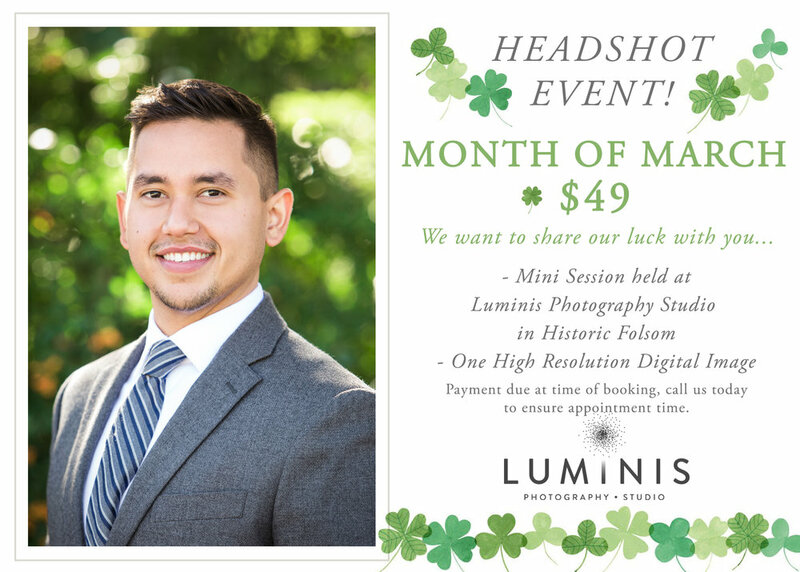 For the month of March, we will be hosting a mini session headshot event at our studio. The Mini Session is $49, and includes one digital retouched headshot image, perfect for LinkedIn or for business cards.